Yesterday we drove 2 hours inland to a white water rafting river from Balis highest mountain, 3000m up (we didnt go that high but still). We jumped in our boat with our seemingly blind captain, who Gary described as “is this bloke seeing what I am seeing, that huge rock coming towards us, yes we”re gonna hit it, oh we just hit it” It was an amazing cruise through jungle/rain forest/Africa, and a great way of seeing another side of this beautiful country. 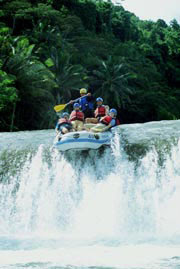 We managed to hit a lot of rocks, go backwards through many rapids, and there was a 4metre drop which was amazing. The girls in the front had quite a fright, it was amazing to do, and after there was lunch included. So we all slept all the way home, before a quick surf in the evening…..